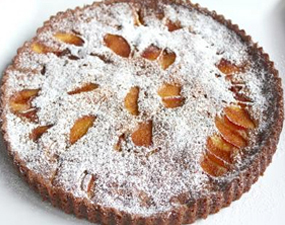 Allergy Free PeachTart is completely gluten free, egg free, dairy free and it still tastes amazing. It looks amazing; perfect dessert to bring to a party! This recipe was not tested by Bob’s Red Mill. Gluten Free, Lactose Free, Soy Free, Vegan. Step 1: Preheat oven to 350°F. Grease a 10-inch tart pan. Step 2: Cream sugar (reserving 1 tsp of sugar for later) and margarine with a mixer. Step 3: Add flour, applesauce, baking powder, baking soda, vanilla and vinegar to the sugar mixture. Combine well. Step 4: Spoon into the tart pan and spread so it covers the bottom. Step 5: Cut peaches and place in a the dough starting from the edge of the tart and filling it in until the dough is covered. Step 6: Mix cinnamon and sugar and sprinkle on the tart. Step 7: Place in the oven and cook for 25 to 30 minutes. Step 8: Let cool before cutting and sprinkle with powdered sugar.